7 Kids and Us: Find It Games are so much fun! A fun game we like to play in the car is I Spy, but when at home we love to play the more modern game called Find It. What is great about the Find It games is that all ages can play, and you can have as many players as you would like. Find It is a fun way to test your skills. Inside a tube is a million little beads which in the beads are different objects so the goal is to turn, shake and whatever to find the hidden object which is on your card, the player who finds all the items first wins. I received the Find It Dino and the Find It "Glitz & Glamour". The Find It Dino has over 40 unique items which are themed to dinosaurs, life back then and more. The Find It Dino has earth toned pellets which hides the many objects. The newest to the Find It games is the Find It "Glitz & Glamour". Which is great for a girls birthday party, sleepover, and more. The items in the tube are like that of the Find It Dino but with a girl theme. 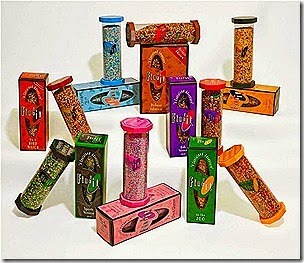 The pellets are pinks and purples, items are things like rings, diamonds and more. All Find It games come with playing cards and Ways to Play sheet. We love to mix it up and give players a time limit to finding their pieces on the cards. It makes for a exciting game, we use the sand timers to play. I like to place a spin on things as well, I use it for chores. So lets say the child who finds the most gets the easier of the picking up, but I know some are better and if its a week of winning I will change it up so the other kids get a chance. I really love the Find It games your able to take and play them anywhere with a tightly sealed container they are safe from any mess. Even without cards your able to play. You can check out all the different types of Find It games by clicking here. If you wanna keep up to date on the newest editions Like Find It games on Facebook.